To solve the dilemma, physicists looked to the idea of entropy, a measurement of disorder or randomness. The laws of thermodynamics state that in the macroscopic world, it's impossible to reduce the entropy of the universe — it can only increase. 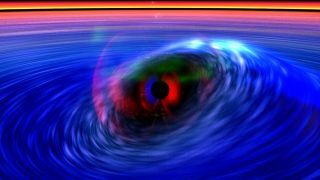 If a person were to fall into a black hole, entropy would increase. If the person were to pop back out of it, the universal entropy tally would go down. For the same reason, water can spill out of a cup onto the floor, but it won't flow from the floor into a cup.